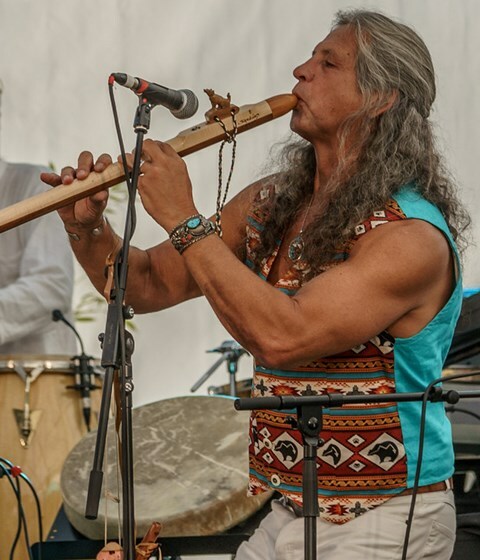 International Three-Time Native American Music Award & Multi Award Winner, Recording Artist and Performer, Native American Flute Player and Singer is a well-known artist who honors Native American culture through his music. He is also world renowned for his work with his band Big City Indians. 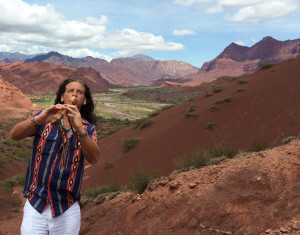 His Indian spirit has carried him to faraway lands across Europe and the U.S. to share his soulful flute music. He is a regular guest on many festivals and gatherings throughout the world. Wolfsheart’s 5 solo albums garnered great international success. He embraces Contemporary Native American, Chill-Out, Pop with grace and passion. 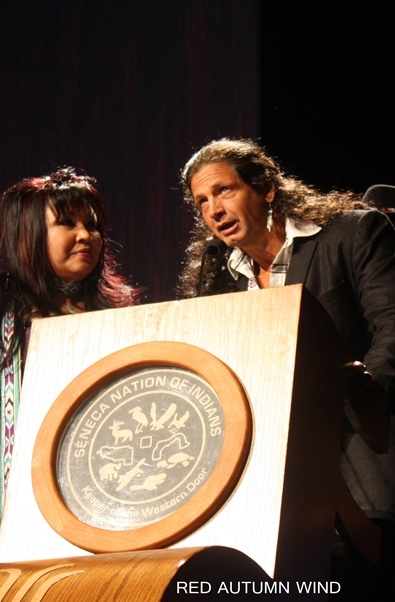 He has received many prestigious awards including three Native American Music Awards. He has also won the Silver Arrow Award multiple times throughout his career thus far. Since his childhood days he feels closely related to nature and freedom. Growing-up in a surrounding, which accepted his personality, Wolfsheart naturally interiorized the Native way of life. The strong respect for mother earth and her gifts as well as for the dignity of every human being is a basic intrinsic value he believes in. Thus, it was a great honor for him to receive the Indian name WOLFSHEART from a Kalapuya Native during a special honorary ceremony. The wolf is a creature with a high sense of loyalty and strength. 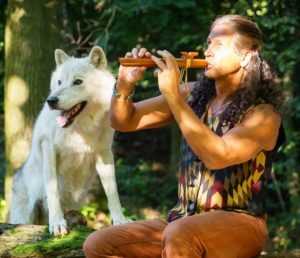 Wolfsheart´s emotional soft woodwind notes are able to transfer you into a state of total relaxation, while stimulating your soul at the same time. Travel through the boulevard of your dreams and find yourself in an oasis of meditative inner peace. Unique tunes explore the landscapes of the soul, allowing for stimulating moments of relaxation. Atmospheric moods and feelings invite you to a journey of fantasy. 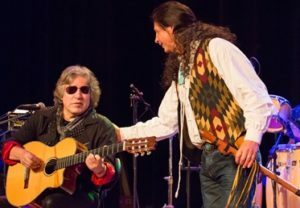 After some live performences with one of the world’s most widely respected guitarists Jose Feliciano they recorded together the fresh world music song: „Red Dust On Route 66” that makes every listener dance. That unique, groovy Dance-World-Native-Trance-Sound received a nomination for Best Single of The Year at the Native American Music Awards 2017. 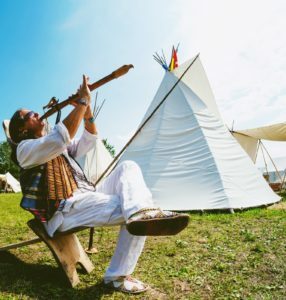 In 2013 his band Big City Indians solidify their commitment to the world’s largest environmental event “Earth Hour”; their single, “Earth Is Crying – Dry Her Tears” became the anthem for the official Earth Hour Austria. “Since my early childhood days, I have been closely related to nature, music and freedom. Thus Native Indian Culture fascinated me and drew me to look into its philosophy. I found my deep respect for nature’s rhythm and its gifts as well as my strong respect for every human echoed in the Native Indian Philosophy. Though it is different to the surroundings I grew-up in, to me it felt as if these two worlds melted into one. So, in order to better understand and grasp the world of the Native Americans and to be able to feel their music, I began to look at people’s life of those times. I tried to understand more about their faith and their legends, which they expressed not only in special ceremonies and rituals, but also in the harmony of their co-existence with Mother Nature and in the magic of their music. I do not want to pretend to be a Native American, but I am truly an Indian at heart. Thus it was a great honor for me to participate at a special ceremony in the Natives’ Land and to be given the name “Wolfsheart” by a Kalapuya Native. The wolf has been accompanying me since my childhood as a source of inspiration. It is an extremely social creature, often acts as teacher and scout and is considered and was often worshipped as protector and supernatural being. Also the different instru ments used in the ancient American Culture have been fascinating me for a long time. I was soon caught by the spell of these instruments with their exceptional sound. Using the instruments myself, I found a way to express my feelings. Having a natural instinct in making all items from their way of life and sold world wide, the Flute was a continuation of a path for me to follow. I taught myself how to play.